(photo by me)[/center]The New York City Police Department is remembering a retired detective who died Sunday morning. Detective Kevin Czartoryski worked for the NYPD's public information office. He was also Commissioner Ray Kelly's liaison to the gay, lesbian, bisexual and transgender community. Commissioner Kelly released a statement calling Detective Czartoryski a "consummate professional" who "served with great distinction". Stunning news about an old friend of a number of us here at Blue Pride. We go back over 20 years. Kevin was awaiting a lung transplant. Another victim of 9/11 nine and a half years later. More NYPD Police Officers have died after the fact than died on 9/11/01. As well as countless other first responders. Please contact Senators Scott Brown, John McCain and Mike Enzi and urge them to get on board with passing the Zadroga bill, to help the many first responders who are suffering at this moment. Kevin was a long time member of GOAL NY and a liaison to the LGBT community in addition to the many other duties he performed over the years. A great, funny and professional guy who will be sorely missed. He was a good man. I'll miss him. This is very sad news. May he rest in peace and may his family and friends find comfort. I think it's great that the news of his passing has been reported worldwide. I saw an article about him in an Indian online newspaper. And it has been reported across the USA as well. 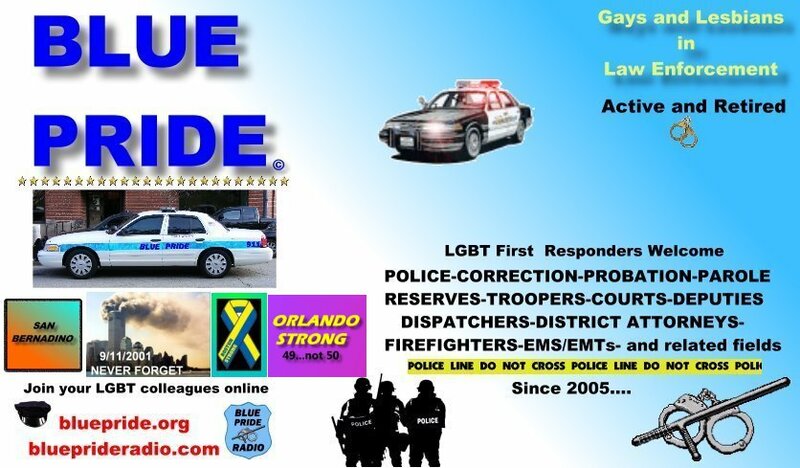 It lets people know how highly he was regarded both as a gay Police Officer, his role as a liaison and most importantly (in my opinion), the plight of 9/11 first responders and how they've been getting such short shrift in terms of health coverage after literally laying their lives on the line on that tragic day and it's aftermath. It's possible that his death would be the convincing point to steer more politicians to actually help get the Zadroga bill passed. What an added high point to Kevin's already strong legacy that would be. I felt I had to stop by his grave today to let him know his death was avenged. I feel like he knew it already, though. He does indeed, Tommy. There are many belief systems about spirituality and afterlife. With all my training and experience in dying, death, grief, bereavement and mourning, I have no idea which (if any) are correct - or even close - if at all. Nor does it matter, I suppose. What I know for sure is there is no "mine is right and another person's is wrong" answer. The soul lives on in each of us who were touched by a life. It lives on in the most honorable way that we need for it to live. And, yes, Tommy, Kevin knows. Today I attended the street naming for my old friend Kevin. It was in his old neighborhood where I used to drop him off many years ago. It was a beautiful sunny day. My sunburned head will attest to that . And it was a beautiful and loving tribute to him. There were some of the usual political hacks personalities there, giving speeches but still, it was all done with affection for Kevin. The following video is of the Police Commissioner speaking and then the unveiling of the street sign. All in all, a great tribute to a great hero.